Gongchao on the attempts of the Chinese state to handle growing unrest and struggle. 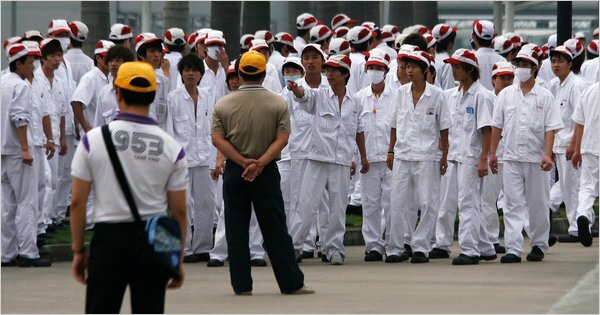 In spring 2010, workers at a Honda plant in the industrial city of Foshan, Guangdong went on strike. They overcame the split between permanent employees and technical student interns and brought Honda's entire production in China to a halt. The transnational company was forced to increase workers' wages by more than 30 percent. This conflict triggered a strike wave across several industries and regions that lasted about two months. In autumn 2011, the inhabitants of Wukan, Guangdong took control of their rural town and kicked out local party and government staff. Corrupt officials had sold off land without proper compensation for the peasants. After locals fought off the police and staged large assemblies in the town center for several weeks, the government accepted an investigation into the sale of land and elections of a new local government. These are prominent examples of the success and failure of the Chinese government's counterinsurgency policies. Social unrest has been increasing since the mid-1990s, involving all three dangerous classes – peasants, urban workers, and migrant workers. Land conflicts, strikes, and riots in the countryside as well as the cities could be harbingers of an explosion of struggles that might blow up the existing socioeconomic power structures. However, the counterinsurgency policies were successful because the explosion has not yet taken place, despite the tension and frictions. Social unrest has put immense pressure on the regime but has not loosened its grip on power. The new ruling class of old Party officials and their Capitalist offspring1 and allies have not only modernized and strengthened the anti-uprising apparatus, but also created a range of institutions to mediate, pacify, and integrate social conflicts. While the explosion has not yet happened it still might. The reasons why neither repression nor integration – nor a certain improvement in living conditions – have successfully blown out the flame of revolt can be read as being due to a list of social horrors: a huge income gap, displacements, low wages, long working hours, lack of work safety with millions of dead or maimed workers, lack of an effective social insurance system, mass lay-offs, old-age poverty, widespread corruption, and embezzlement – each a reason to keep on fighting. There are two questions that proletarians, peasants, and all indignad@s in China and elsewhere eventually have to answer: since capitalism reproduces these social horrors, how do we get rid of it and what comes afterwards? No Communism Before, Or No Communism No More? In 1978, China's Communist Party (CP) regime set out on a long march from capitalist state socialism to state socialist capitalism. The old socialist system had combined the modernist belief in industrial (Taylorist, Fordist) development with land reform, mass health care and welfare on the one hand, and urban-rural Apartheid, nationalism, militarism, authoritarianism, and patriarchy on the other hand. The political, economic, and social crises of state socialism in the 1960s and 1970s forced the regime into trial and error reforms, without it knowing where it would end up. The process can be called the three long decades of reform and development. In the first long decade from 1978 to 1992, the CP and state structures began to cooperate with transnational capital to change the conditions of capital accumulation and the reproduction of labor power. Foreign capital was allowed to pour into the country. The Chinese state provided the conditions for profitable industrialization by, for instance, loosening tight migration policies and thereby opening the supply of new labor power for the newly formed Special Economic Zones. The first cracks began to emerge in the socialist Iron Rice Bowl – a set of welfare measures available to a minority of mostly urban workers. Moreover, the Communist Party started to eliminate its former class struggle rhetoric, beginning to use reactionary concepts of social stratification2 while keeping other elements of the Maoist "social glue", being Chinese nationalism and repression. Meanwhile, an intensified commodification of labor, economic crises, and increased work pressure lead to popular discontent in many parts of the country that culminated in the Tian'anmen Movement in 1989. Contrary to the common view, this was not just a student and pro-democracy movement but a massive popular uprising against social conditions and the regime. The crackdown on the movement with tens of thousands of casualties, death penalties, and arrests, weakened popular opposition and opened the way for even harsher attacks on the working-class. The Fourth Long Decade or the Beginning of the End? In a few years we might see 2010 as the beginning of a fourth long decade of reforms. The global crisis and increasing social struggles world-wide have changed the context. In China, social crises and conflicts might open up chances for change. The Honda strike and subsequent strike wave together with a series of suicides at the gigantic electronics producer Foxconn have had a great impact on the public debate on labor unrest and social justice within China. While some proletarians can use strikes as a means of struggle (as they work in industrial units with hundreds or thousands of others with similar interests), others continue to use popular uprisings and riots as a means to express their anger and a form of "collective bargaining by riot". The increasing amount of autonomous forms of organizing among workers and peasants has raised the specter of revolt and lead to a renewed debate within the power structures about how to deal with social pressure from below. Meanwhile, interrelated with the intensified class antagonism, many of the institutions underpinning Chinese society have undergone dramatic changes since the 1980s. This has led to a crisis of social reproduction and gender relations as well as resulting in (women's) struggles around the organization of reproduction and social freedom. Migration, the One Child Policy and the latent disintegration of the biological family has led to the changing status of women in the families and in society and a deep "care crisis". As usual, capital uses the desires of the oppressed for improved living conditions to implement new forms of control and exploitation. In this case many women take the opportunities migration offers to escape patriarchal control and oppression in the villages, only to end up in a new industrial world of exploitation under a different patriarchal regime. In combination with the commodification and rising costs of domestic labor, health care, and education, this has produced enormous social misery and deepened existential fears. Workers in China are forced to improve their personal suzhi (social quality or human capital) in order to improve their chances on the labor market and to fulfill the requirements of reproduction,4 while long working hours and long-distance migration have resulted in dramatic "time crises" in workers' everyday lives.5 Further social tensions have arisen from the simultaneous existence of unemployment, precarity, exploitation, ongoing racist discrimination against migrants and so-called minorities, and ageist industrial policies that favor young labor forces. The state knows that it has to keep on orchestrating these tensions and invent and use social technologies to weaken social revolts. It is trying to adapt the mechanisms of conflict regulation to the new labor relations. This includes a further modernization of the migration regime (hukou), new labor regulations, and the rigid channeling of conflicts through state agencies and state unions. Above all, the regime is using its new economic power and imperial role to try and ensure economic growth – despite the catastrophic effects of this on nature and humans. It has to make sure to meet the self-proclaimed 8 percent growth rate so it can create enough jobs for old and new proletarians and thereby prevent further social turmoil. It also needs this growth to uphold the banner of the capitalist dream of continuous material improvements and the promise of a better personal life for the suppressed class that it keeps at work, in chains and in good spirits. What we see in this possible fourth phase of reforms is a self proclaimed market-socialist state that still focuses on capitalist growth and modernization and now considers the "privatization" of land in the countryside and the final industrialization of agriculture. This is the last major reform that could complete the proletarianization of rural populations by taking away their (limited) means of subsistence. This state is mixing strategies of capitalist exploitation and workfare with a different set of social techniques of repressive tolerance than proletarians in "Western" states have to deal with. If we look at this from a perspective of social revolution and liberation, the repressive parts of China's counterinsurgency policies, and the capitalist fixes (forms of restructuring aimed at weakening the workers – like capital relocation, automation, division of workforces as along gender lines, etc)6 are obvious targets of struggle. Meanwhile, other targets are obscured by the diverging interests of left-wing actors and ideologies. The spread of struggle in China could open up new social perspectives of change. Ten years ago many struggles were based on kinship forms of organization and limited to cellular mobilizations in one company or neighborhood. Within a decade, a new layer of worker activists, as well as so-called citizen lawyers and citizen journalists have emerged, and peer and interest groups have supplemented the kinship networks.7 While still limited by the hukou division (between rural and non-rural workers) and the labor and community hierarchies reflected in the strike committees and self-organized initiatives, it is evident that a new class (re)composition creates astonishing social dynamics: strike waves, copycat and domino resistance from the grassroots, debates on conditions, struggles, strategies of organizing and change in the digital cloud of chat-rooms and websites as well as along the physical routes of migration and within proletarian communities. This has effects on rural, migrant and urban working classes, including the so-called ants (yizu), educated but precarious white-collar workers who hoped for a career and end up in low-skilled jobs. The Chinese regime fears that this new under-class might forge coalitions with the blue and pink-collar proletarians and undermine the current order – as during the Arab Rebellions. An example of left-wing illusions and lobby politics is the debate on unions. Unions are one possible tool to control and pacify workers' struggles. These can represent workers' material interests against the interest of capital and the state, but only within certain systemic limits and by accepting capitalist mechanisms – otherwise they would have to break out of their union role. In China, the unions are still mass organizations of the CP and are directly dependent on state financial support and government directives. They oppose all strikes and attack independent forms of worker organizing. That does not prevent left-wing advocates of militant or reformist unionism – Maoist or not – to demand "reform" of the state unions so they can fulfill the function of proper unions against capital and the state. Other left-wing protagonists favor the setting up of Western-type independent unions, counting on them to act in favor of workers' interests, thereby ignoring the long history of union compromise and the weakening of workers' struggles by such unions in countries around the globe. Rather than providing the right "left-wing" repair-kit for the disintegrating capitalist social structure, greasing the cogs of arbitration and pacification of social struggles, or even reinventing the myth of a "workers' state", the left should further engage in and support the 'class making' processes by breaking state censorship and spreading more information about struggles in China and beyond, and by refraining from its constructive role within the limits of capitalism and forging tools of destructive critique. This form of critique has to look through state propaganda as well as the fog around capitalist exploitation and shed light on struggles that can open perspectives beyond capitalism. Concrete methods should include at least two elements – traces of which can be found throughout the history of revolutionary politics in China: the analysis of the processes of class (re)composition from the perspective of proletarians and other oppressed people; and variations of conricerca (co-research), the attempt through militant inquiry to break down the divisions between proletarians, activists, and so-called intellectuals both within China and in relation to proletarians and activists elsewhere – as part of a new organization from below. This is, of course, not just a challenge for the left in and around China, but around the world. It is amazing how – after decades of failed projects of left-wing parties, national liberation movements, and state socialism or social democracy – a large part of the left still holds on to the old leftist narrative of state building, party-based parliamentarism, paternalism, and power politics – even in a time of global crisis and misery that has lead to unprecedented social anger and rebellion. This is the time to attack the cheap-labor model, ideas of social partnership and welfare state compromises. The left has to leave behind concepts of consumer boycotts, corporate responsibility, and left-wing lobbyism and engage in non-paternalistic solidarity across physical and virtual borders. The outdated inter-nationalism needs to be replaced by a perspective of a global working class. That class is still split along the North-South divide, by national labor markets (as well as a sexist and racist division of labor within these markets) and along the global migration chains, but the global wave of struggles opens a chance for attacking and abolishing these borders from below. Global capital went to China, forming a coalition with a party state that tried to survive and defend its rule. Conflict followed, starting in the Special Economic Zones along China's East Coast, and now following the routes of capital relocation into Central and Western China. If the pressure from below increases and forces the regime to make more concessions – as in the past few years – and if the global crisis intensifies and rampages through China, the social struggles there might return to the global level, merge with social revolts elsewhere, and mess up capitalist projects of crisis management. Social struggles often have no political demands – in China as well as elsewhere – but if they form a mass movement they can overstretch the capitalist net of exploitation and repression, and open the way for a world beyond capitalist relations. This process might have just started, and for sure the struggles in China will play a key role in determining its direction and outcome. 1. Many representatives of China's capitalist class are (former) party or government officials or their children. 2. On how the CP left behind Maoist concepts of class struggle in the 1980s – following a global trend of the "farewell to the working-class" – and substituting it with Weberian concepts of social stratification see: Pun Ngai/Chris King-Chi Chan, "The Subsumption of Class Discourse in China", boundary 2. Vol. 35 (2) (Summer 2008): 75-91. 3. The CP introduced the concept of a (socialist) "harmonious society" in the early 2000s, publicly underlining its new focus not just on economic growth but also social justice. The concept was taken from the authoritarian framework of Confucianism the CP had criticized as "feudal" in previous decades. 4. For a description of suzhi as a neoliberal concept – similar to those of "lifelong learning" and "self-management" – see Yan Hairong, "Rurality and Labor Process Autonomy – The Question of Subsumption in the Waged Labor of Domestic Service", Cultural Dynamics, Vol. 18 (1) (March 2006): 5-31. 5. On the concept of lacking control over time and resulting "time crises" seen from a feminist perspective see: Liu Jieyu, Gender and Work in Urban China. Women workers of the unlucky generation. London/New York (2007). 6. On the fixes see Beverly Silver, Forces of Labor – Workers' Movements and Globalization Since 1870, Cambridge (2003). 7. See Pun Ngai/Chris King-Chi Chan, "The making of a new working class: a study of collective actions of migrant workers in South China", The China Quarterly, 198 (2009): 287–303. 8. A more detailed account of the Chinese "left" goes beyond the scope of this article. For a discussion of the Maoist legacy and the "liberal" so-called New Left in China see Lance Carter, "A Chinese Alternative? Interpreting the Chinese New Left Politically", Insurgent Notes, Issue 1 (June 2010).